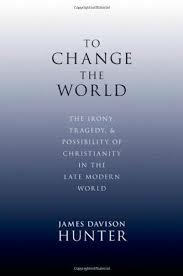 My “Religion, Self, and Society” class just finished four days immersed in James Davison Hunter’s To Change the World: The Irony, Tragedy, and Possibility of Christianity in the Late Modern World (2010, Oxford University Press). It was a great read and the students said it was their favorite book of the semester. As I worked through my daily summaries, I was struck with the timeliness of Hunter’s argument and the vibrancy of his critique of how the church (and, I would add, the larger culture) have misunderstood the dynamics of social change. Hunter begins the book examining the ways in which evangelicals have attempted to change the world over the years. This approach has focused heavily on “Values” and working to get people to believe “right things”. The popular evangelical focus on Christian Worldview is a good example of this strategy. Citing writings from Chuck Colson and a dozen other evangelical figures, he shows how this inside-out sense of change is articulated. If we can change individuals, we can change the world. The problem, as Hunter clearly demonstrates, is that such a view is based on a remarkably naive view of social structure, power, and culture. Such an effort has created subcultural dynamics in which evangelicals have worked in small-scale cultural creation that mimics the larger culture but with evangelical focus. The result is an insularity from broader culture which makes social change harder to achieve. Furthermore, power is embedded in institutional forms that call for Christians to engage in political activity not as voting blocks but as those attentive to the levers that can create change. Hunter reviews and critiques efforts by the Christian Right, the Christian Left, and the Neo-Anabaptists for being insufficiently distrusting of Constantinian forms of power. The Right, acting in a stance he calls “Defensive Against”, attempts to gain the state levers of power to bring about moral change. Moral outrage and a sense of victimization (which he calls “ressentiment”) is central to the moral challenge. The Left, “Relevant To”, attempts to organize legal frameworks to eliminate suffering and inequality. The Neo-Anabaptists (in his telling — I’m reserving judgment) want to maintain “Purity From” power but in that negation they allow power to be exercised in normal institutional ways. [F]aithful presence is a theology of commitment and promise. The commitment is “covenantal.” It is a binding obligation manifested in the relationships we have, in the work we do, and in the social worlds we inhabit, and it is all oriented toward the flourishing of the world around us (261). Beyond being a good in its own right, there are at least two reasons why Christians must move in this direction. The first is a political reason: Christians cannot demand for themselves what they would deny others…The second is a cultural reason: the very plausibility and persuasiveness of the Christian faith depend on a cultural context in which meaning, purpose, beauty, and belonging are possible (263). This is an older wisdom, but in the situation in which Christians find themselves today, it holds the markings of a new paradigm. A theology of faithful presence calls Christians to enact the shalom of God in the circumstances in which God has placed them and to actively seek it on behalf of others. This is a vision for the entire church (278). Finishing the discussion of Hunter’s book while awaiting the grand jury announcement in Missouri was pretty surreal. It got even more surreal as I started seeing social media posts following the announcement. As I’ve written, I wasn’t expecting an indictment for all kinds of reasons having to do with burden of proof, demonstration of intent, and a systemic bias in favor of law enforcement. I’m still trying to make sense of things a day later. I’m somewhat disconcerted by the attitudes and complexities involved in a situation like Ferguson. So all I can do at this point is ask some questions. 1. How can we affirm the reality of black distrust of law enforcement without people assuming we’re supporting lawbreakers? There are real, demonstrable, and indisputable facts regarding patterns of traffic stops, searches, and arrests that put African Americans at a disproportionate risk of negative law enforcement contact. Comments about “black on black” crime are insensitive and distancing and are not involved in Faithful Presence. 2. What does it mean to be faithfully present with law enforcement officials? It may be too soon to go here and there are a number of serious questions raised by Officer Wilson’s released testimony. But faithful presence seems to mean that we’d put ourselves in the space of the officer in an uncertain situation. Maybe it means that we’d not leave isolated individuals to make snap judgments on their own but use the nature of collective wisdom to recast situations. Rather than rush to the side of an officer involved in a shooting and looking for rationales from a distance, we need to enter into the ambiguous space. That might mitigate against the situations where every toy gun is seen as an immediately threat. 3. How can the church maintain covenantal relationship with those it has deemed to be “other”? It is telling that our congregations are too white, too middle-class, too law-abiding. We have communicated that “right believers” belong inside the church (conversion stories accepted) and then there is “the world”. Engagement requires physical presence and personal engagement. In short, Incarnation. I’m the first to confess that I have not turned this commitment into action. I working on repenting, on changing my practices. 4. How can we focus our witness on the Imago Dei of all participants? There aren’t bad apples or racist cops or thugs or looters. There are children of God and our call is to be invested in their flourishing, especially when they don’t look and act like “my people”. This requires us to avoid the crass categorizations that are the substance of both cable news coverage and social media feeds. The one thing that the prosecutor got right last night was that there was a tragic event that cost a young man his life. We should all feel that pain, whether he stole cigarillos or not. In the end, we approach a situation like Ferguson as an opportunity to be with people who hurt, to do good work in their midst, to seek their flourishing, and to represent God’s Kingdom breaking in their midst. It’s not about protecting our values or simply making political changes (even if those are needed). It’s being in relationship representing God’s work in His world. Against the present realities of our historical moment, it is impossible to say what can actually be accomplished. There are intractable uncertainties that cannot be avoided. Certainly Christians, at their best, will neither create a perfect world nor one that is altogether new; but by enacting shalom and seeking it on behalf of all others through the practice of faithful presence, it is possible, just possible, that they will help make the world a little bit better (286). I will certainly check this book out, seems very timely. Regarding your second point, was wondering if you have read Malcom Gladwell’s “Blink” (esp. the Seven Seconds in the Bronx chapter about police violence). I was really interested in his take on how we should work not only for long-term social changes but look at immediate solutions that will help people (one of his ideas was removing race and gender identifications during trials, so that juries are not biased against black men, another was structuring things so that cops don’t have to respond so immediately in dangerous situations, which causes them to make poor snap judgements).